Language Arts: In Phonics, we completed Jolly Phonics workbook 3, Alhumdulillah. In this workbook, we learned how to sound out these letters: ”b,g,o,u,l,and f.” We also learned the correct letter formation for the letters listed. In addition to this, we also learned how to blend, sound out, and write three letter words by stretching each sound first and then blending them quickly to say a word. We have been practicing the new sight words that are posted on our classroom door. We will practice some review activities from book 3 until winter break. We will start workbook 4 after winter break, Insha-Allah!. Sk2 is doing an excellent job reading, practicing, and writing the new sight words that are written on the classroom door, great work SK2! In reading, we did choral reading. We read the books, “Pete the Cat, I Love My White Shoes,” “Pete the Cat, My Four Groovy Buttons,” and “Brown Bear, Brown Bear What Do You See. We also integrated Islamic studies by doing story sequencing for the story of Prophet Nuh. We put picture cards from the story in the right order, to retell the story. Please go to http://www.starfall.com/ at home to do some extra practice for the sounds we already covered in class. Practice finding two letter and three letter words with your child while reading at home. Math: We were learning how to write numbers in words and reviewing how to do tallies in our Math class. We had completed how to write the numbers 8, 9, and 10 in words. Also, some students came up on the board to find numbers, that were written in words, in the poem “One, Two, Buckle My Shoe.” Lastly, we did some hands on activities in our math centers to review what we learned in Number Sense and Numeration over the past few weeks. Have your child skip count by 10’s out loud. Have your child distribute cookies or some healthy snack to family members, with each person getting an equal amount. Science: In Science, we started a new unit about “Living And Non–Living things”. In our first class, we watched a power point and an educational video on living and non living things, then we had a class discussion about it. It was a very interesting and meaningful session, Alhamdulillah. We will continue learning about living and non living things until winter break. 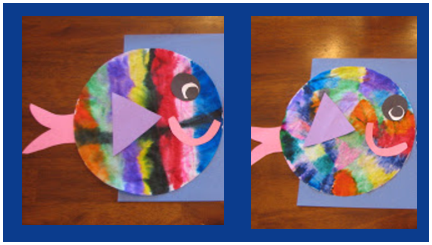 Visual Arts: In Visual Arts, we made rainbow fish from coloured coffee filters to integrate with the letter “F” (for fish) and with the living things unit we started this week. We started learning about the first pillar of Islam, “Shahadah”. We learned what Shahadah means (There is no god but Allah and Prophet Muhammad (peace be upon him) is the last messenger of Allah). We also learn what we say after the name of Allah (Subhana Wa Taala) and prophet Muhammad (peace be upon him). We read a book “Allah Created Us All” and discussed that all living things and non living things in nature (Rocks, Sun, Moon, Sky, Stars, Clouds, Sand ) are created by only one creator, Allah (Subhan Wa Taala). We also made a beautiful frame for the name of Allah (Subhan Wa Taala) with colored egg shells!